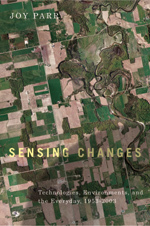 The use of new digital media in conjunction with conventional print publication is one of the many important contributions that Joy Parr’s recent Sensing Changes: Technologies, Environments, and the Everyday, 1953-2003 (2010, UBC Press) makes to our understanding of the past. The book examines how Canadians living in environments affected by megaprojects built after the Second World War responded to rapid environmental, technological, and social change through the use of six case studies. Parr argues that our senses – not only sight and hearing but also touch, taste, and smell – are essential to how we understand the world around us. But how can the conventional printed book, which privileges the sense of sight in the form of black text printed on a white page, facilitate an argument that urges us to reconsider the importance of humans’ varied senses? Parr, in collaboration with new media designer Jon van der Veen, has taken up this challenge with Megaprojects New Media, a series of online exhibits that “parallel” the text contained in her book. A short introduction by van der Veen precedes each of the book’s chapters and informs the reader of the diverse media available on the website. The use of new digital media to promote a published book’s goal of a more “sensuous history” inevitably contains some dilemmas. The most obvious issue is that digital media – similar to conventional print – also prioritizes sight (along with sound) at the expense of touch, taste, and smell. Indeed, a majority of exhibits on the Megaprojects website still cater primarily to sight and sound through the many maps, oral interviews, songs, photographs, and other sources found on the website. Yet one of the most unique exhibits on the site is a series of virtual walking tours that use oral evidence from local people to reconstruct the “lostscape” of Iroquois, Ontario before the St. Lawrence Seaway project flooded much of the old town in the early 1950s. Although this technique still relies upon sight and sound, the locals’ descriptions, historic photographs, and maps allows the listener-viewer of the exhibit to imagine what the town may have been like in multi-sensorial terms. The tastes, smells, and touches of old Iroquois as remembered by locals emerge as visitors journey through space and back in time. The Megaprojects-Sensing Changes project illustrates the opportunities that digital media offers to conventional print publication. In what other ways are historians using digital media to augment more traditional methods of (re)presenting the past? What are its challenges? What are its possibilities for the future?